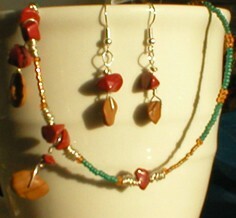 Mustard and red jasper pendants on silver-plated wire, silver ‘beads’ made by wire-wrapping (I really like these and will be making more), small green seed beads and Miyuki Delica seed beads in galvanised rose/gold – these last came in my mystery beads and are very shiny – and larger orange-topaz seed beads. Strung on flex-rite with a hook and eye fastening. It took an age to come up with the name. See, it made me think of Tutankhamen, except not quite, so I was looking up that period in Egyptian history and found Meritaten, who was the eldest daughter of Akhenaten and Nefertiti. She may or may not have been briefly married to her father, probably was married to Smenkhkare (who was a co-ruler with Akhenaten for a while, then briefly a pharaoh in his own right), and might have also been the female pharaoh Neferneferuaten who reigned for two years and one month, prior to Tutankhamen… but there’s an awful lot of uncertainty about that period in history, and a lot of theories about which names refer to who, how they were related, and when they died. The above is just one narrative, but it’s one that I like. A few days later I made some earrings to go with it. I have a Canon Pixma all-in-one printer/scanner that my boyfriend’s mum got for us last Christmas. We’ve only needed to print out a couple of things to date – it gets far more use as a scanner. I scanned my Illusion of Peaches necklace fine one night, then the next night I switched it on and it displayed a “Cannot recognise cartridge” error message, indicating the cyan ink. This is the ink that came with it and has hardly been used. Reseating the cartridge did nothing. And through a truly stupendous piece of design, you can’t scan while the printer is “undergoing maintenance”. I looked it up online and found a lot of other people who’d had the same problem. It appears the chips for Pixma cartridges have a high failure rate. We’re still under warranty, and Canon will supposedly replace cartridges for you in this situation… but we can’t find the receipt for the printer (which we definitely have. Somewhere). 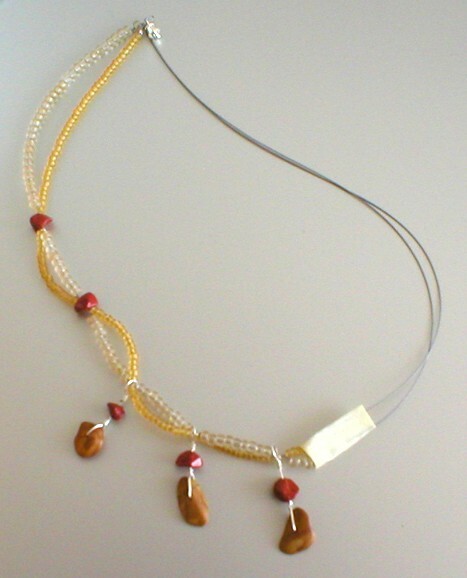 This necklace was to try out my beading wire and crimps. I’d ordered 7-strand BeadSmith flex-rite, which is the hobby stuff, but it seems the seller I bought it from (Sanctuary Beads on eBay) was out of stock, so they replaced it for free with the 49-strand “professional” version. Which was very nice! Flex-rite is made of strands of steel wire covered in nylon coating – the coating on mine is clear so it looks steely. You can get coloured ones. Beadalon also make a version, and there’s tigertail which is the more generic beading wire but is stiffer, can kink and doesn’t drape as well. I marked the wire beforehand with a thin cd labelling pen so I could see where to put things (it wipes off with a hankie if still visible after). 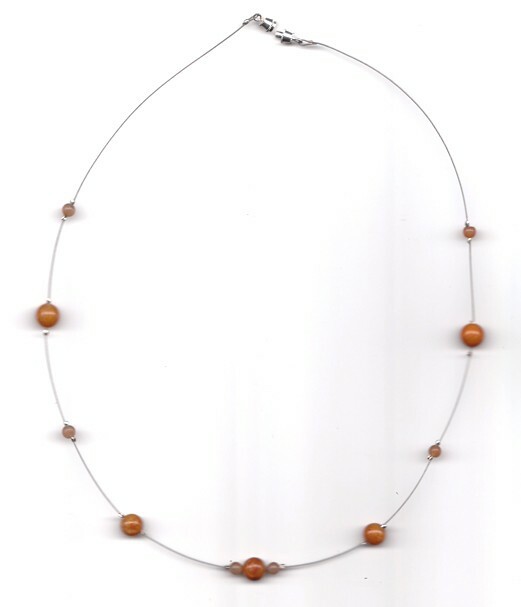 The necklace ends were annoying – you thread the crimp on the wire, thread on that half of the fastening, then bend the wire and run it back through the crimp a second time. However, wire is sproingy… It took some fiddling and many tries to get everything held in the right place so I could actually crimp the bead. My crimps could do with more practice too – they’re a bit messy. (I have a pair of self-closing tweezers now – you squeeze to open them. This would have made doing the ends much easier!) The necklace has a screw fastening. I wore it to work, and decided I wanted a matching bracelet and earrings, so I made them the next night. (Definite benefit of making your own jewellery!). For some reason I was having a whole lot more trouble with my crimps that evening – I think I was probably just using too much force and kept breaking them. It was still nice and sunny when I got back that evening, so I took the opportunity to experiment with some photographs. 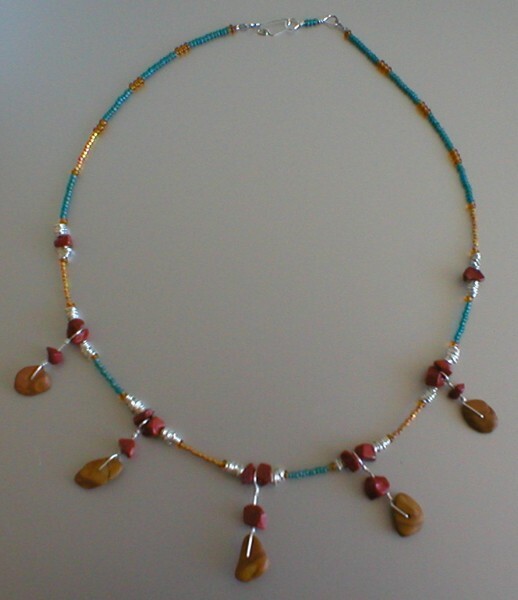 (‘Tween necklace and extras, my scanner ceased to co-operate… For this piece, I do think the photographs are better). 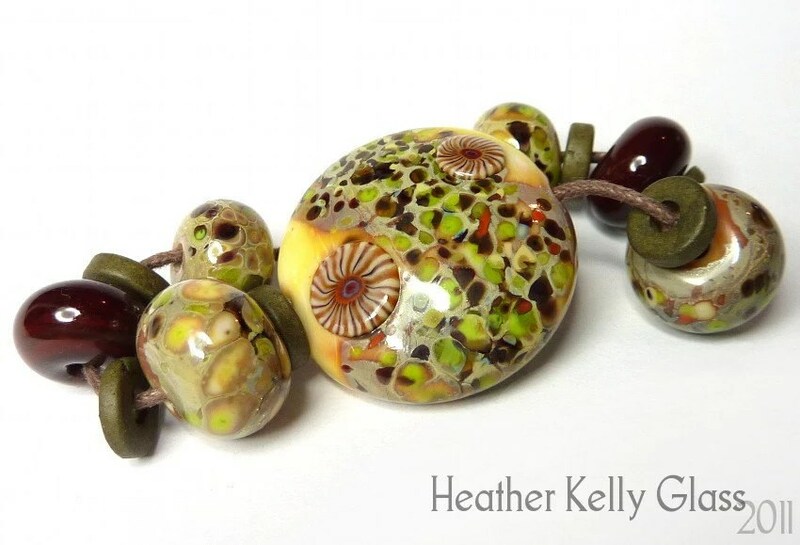 The beads were from my mystery box, most of which I identified from the website, but these were tricky as the colour can vary so much. 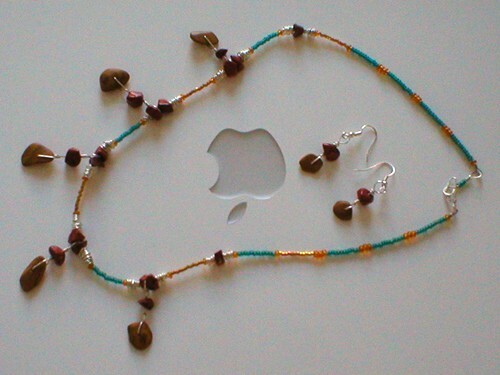 The little beads are pinky-orange and the bigger ones are orange-yellow. After a lot of looking, I’m calling them honey jade because they match up with what other people call that. This is a descriptive term – it isn’t real jade at all, but can be jasper, serpentine or red aventurine. 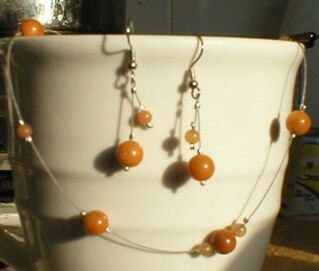 (I suspect the larger stones are probably red aventurine, and possibly the smaller ones too). Speaking of so-called “jade”, here’s Wikipedia on faux jade and JewelrySupply on some jade types and what they really are. You can see why people describe these stones as jade – they don’t look like what one would picture when serpentine or jasper are mentioned. I’ve been making this on and off since last weekend – it took rather a while. 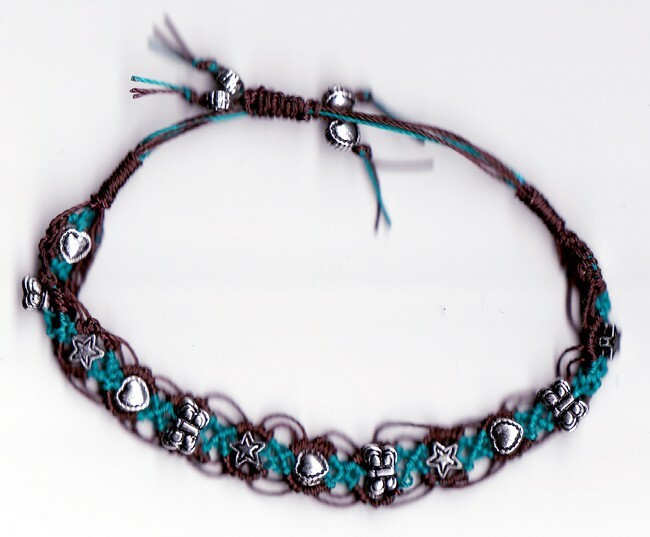 I used the pattern from Free-Macrame-Patterns, but mine’s slightly different – I didn’t realise until I was halfway through that you were supposed to start in the middle of your pieces of cord so you could work outwards in both directions, so mine just went the same way for the whole thing. This also meant I had to fudge the ends a little as the top ones weren’t long enough to do the right knot. It could all have been solved by more photographs in the instructions! It has a sliding fastening, shown at full stretch. You pull on the heart strings (ohohoho) to tighten it once you’ve put it on. I was using C-lon beading cord, which has a diameter of around 0.5mm. The pattern says to use 50 inch lengths of cord – that really wasn’t necessary. 30 would have covered it. 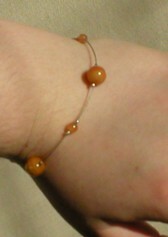 The beads are little silver-painted plastic things that I got in my mystery box. I rather like them – the black in the lines makes them look slightly tarnished. If I was doing it again I think I’d leave out the butterfly ones though, as they have to stick out of the design to fit. The construction required judicious use of nail polish (it can be used instead of clear glue to coat the ends and stop them fraying, and to glue the very end knots on a thread together so they’re unlikely to come undone). While making it, I was using a mini-corkboard that I picked up from a pound shop. It’s very thin, but you can stick pins in it and in this case, use masking tape to fasten the top of the bracelet to the top of the frame. I also used masking tape to keep my current holding cord taut. 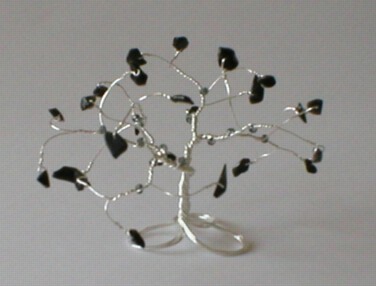 As the other part of my mum’s present, I made a new tree. I was aiming for a small tree for ease of transportation. 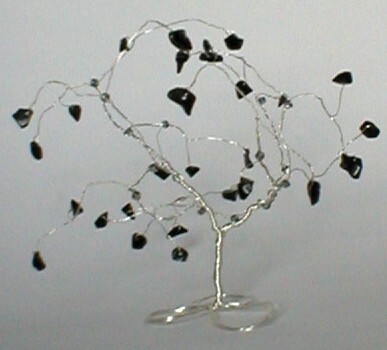 However, I used pieces of wire that were far too long (the kind of lengths I use for the cherry blossoms) so it wasn’t going to work for that. It’s also amusingly springy because of how thin the wire is. 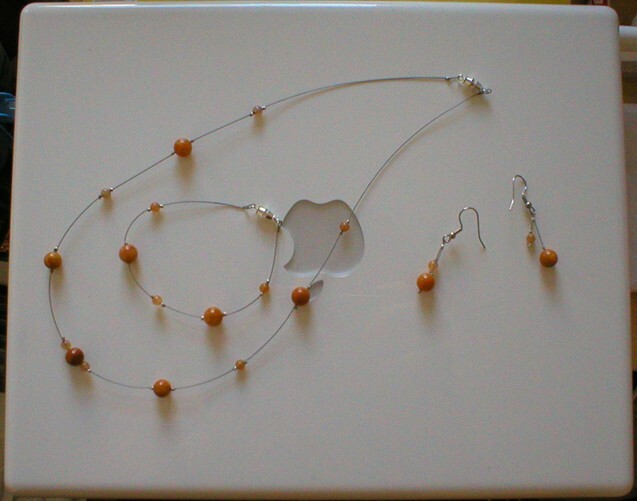 (My 0.5mm silver-plated wire was still at the post office depot – I picked it up the next day). 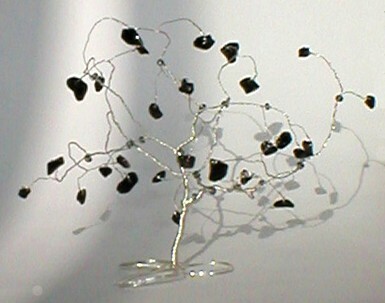 0.315mm silver-plated wire, obsidian chips and translucent grey seed beads. It’s slightly unstable. I think I should probably use a pebble for the base to weigh that down a bit – it does stand up on its own, but it takes careful balancing. So I made a smaller one the next afternoon, using the 0.5mm silver-plated wire that finally got picked up from the post office. 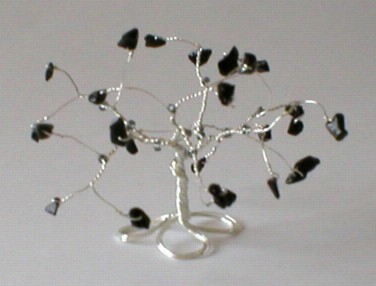 Still obsidian chips and translucent grey seed beads. This one is 3 inches tall by 4 inches in the widest direction. The sproingy one is now residing in my living room.